The links below take you through to further details. 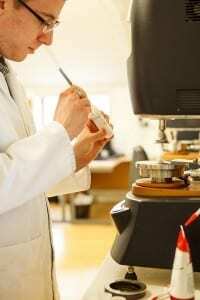 Get a quotation for testing of your samples. Call us on +44 1730 829 858 or get in touch through our contact page. The rheological properties of most relevance to manufactured products comprise viscosity and flow behaviour, structural properties of colloidal and polymer gels and viscoelasticity under low and high deformation conditions. Typical rheological investigations into those properties deliver valuable quantified metrics such as yield stress, viscoelastic moduli (G’, G”, tan delta) thixotropy, and zero-shear viscosity. Learn more..
We can perform viscosity measurements from simple Brookfield viscosity tests to sophisticated measurements across a range of defined shear rate, shear stress or temperature conditions to suit your needs. Learn more..
We have a range of equipment and probes for performing a variety of texture tests on foods and other products and full Texture Profile Analysis measurements for the measurement of hardness, springiness, cohesiveness and resilience. Learn more..
We are now performing measurements of the lubricating qualities of products in contact with a range of soft surfaces for gaining an understanding of the interactions of materials with biological structures such as the skin, mucous membranes, tongue or palate. Learn more..
We can provide a range of powder characterisation methods including assessment of flow functions, wall friction, compaction, bulk density under a range of pressures and stickiness. Learn more..